It was a busy few days of family activities and Mother's day celebrations. Over the weekend some of the family (including three generations of moms) made a little road trip north together to Ocala to meet up with some other members of the family.... some from various parts of Florida.... some from Tennessee visiting here. One of my nieces and her husband are reining horse trainers at Reinwater Ranch there. If you've ever been through this part of Florida you probably find yourself oooooing and ahhhhing at the visual display of rolling hills, acres and acres of horse ranches one right after the other along every long country road. Each ranch is bordered mostly by miles and miles of railed fencing that is so picturesque it is breathtaking. That is, if you like that sort of thing. Which I happened to be one of those that do. It's been a while since I've been around horses. There were mama horses with their babies close by. 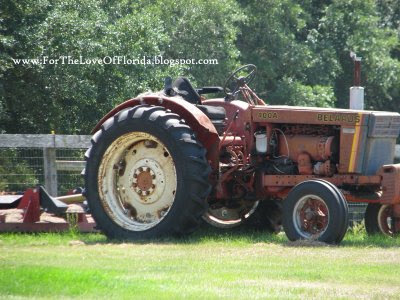 And all that beautiful, big farm equipment just makes me want to crank up an engine and get some work done. 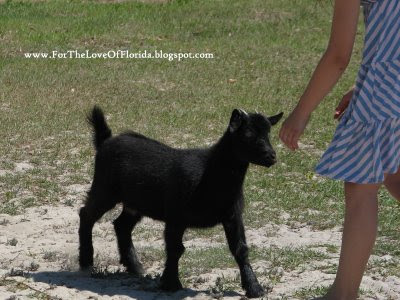 All the children were enthralled with so many farm animals especially the pet goat, Ariel. My niece is an animal lover from birth and has managed to accumulate quite a variety of them now that she lives out in the wild blue yonder with so much land. 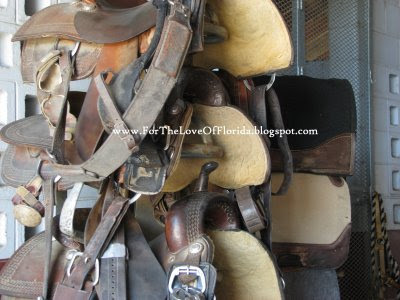 Ranches and horsebarns conjure up the smell of hay and leather and there's that wonderful breeze that blows through the center of the barn stalls which all bring back so many memories of motherhood past. My youngest son grew up training, riding, and reining his own horse. 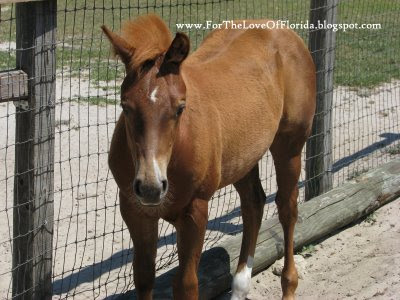 For most of his childhood years we were in and out of barns, pastures, arenas, and horse shows. In his junior year of college we had to make a tough decision to sell his horse. His passion for riding has never gone away. Someday he'll have his own horse again. He drove down from north Florida to ride like he often does. Ocala is almost half way between us. It was great fun for me to watch my cowboy man-child ride again. It's quite possible there is another cutie-wootie cowboy in the making. Thank you, Esther and Brad for a very fun-filled day with lots of good food, family reunions, wild rides, puppy love, and hugs for a happy Mother's Day weekend outing. 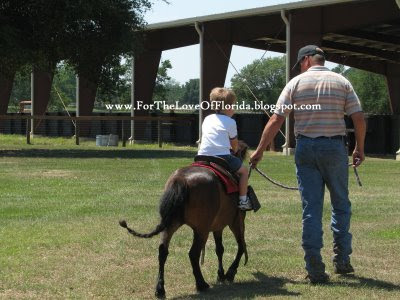 I think you captured the spirit of Ocala in this post...beautiful! I just love driving thru that area! When youngest was @ UF,I'd make Jon drive thru that area.It's such a different world,than here. Thanks for the tribute to our farm, and day well spent together. I am glad it finally worked out for everyone to come up and we will have to do it more often! wonderful capture of the farm at my baby girl's house. so glad you all had a wonderful time there and the boys got to ride. it is an intriguing place to be with all the creatures and the smells. Thank you. It is a beautiful piece of God's land plopped right in the middle of our beautiful state. Taking a beach break are you? I'm trying not to be jealous. I agree, a beautiful drive even over on Hwy301 side which we always take when going to NE Florida. It was a very fun time for everyone. You are a gracious hostess! Nice post and cool pictures. It sure was nice seeing everyone at the ranch. Brad and Esther are always so gracious. You know how much I love being around the horses and the barn. I just love everything about it, always have. 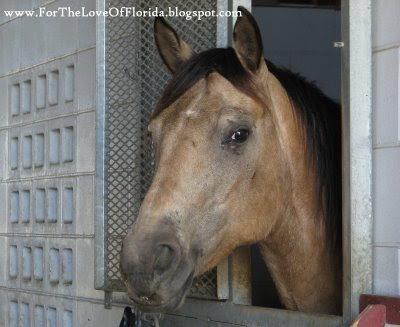 So Ocala being horse country really is one of my favorite Florida locals. great memory day! too bad you didn't capture the new brood of puppies too! the kids were most happy to see, hear and hold those five week-old babies that were just their size to handle. i think that is one of the most fascinating attractions of a farm - always producing new life and caring for the young that need attention. it was so great to have our several generations together too! family, love and sharing our time always rejuvenates and strengthens our bonds! thank you Brad & Esther for being such gracious hosts! Ocala is so pretty... so big and open... I just love everything about it. So nice to have you along... actually I think I was the one that was along... it was a fun day and really great to see the rest of the fam.